Vinyl siding is increasingly becoming popular in Canadian architecture especially over aluminum and wooden sidings. Not only does it gives an amazing exterior look, it can also perform far superior in every respect. With its considerably low maintenance cost, it is the right option for homeowners and businesses alike. No matter what your home exterior, you will always find the suitable vinyl siding to match. And most importantly, there are no painting worries. Simply pick the most relevant shade and start installing.From brick design to shakes and shingles, they are the perfect match to a variety of interiors. There are numerous advantages of vinyl siding over the traditional sidings. Vinyl sidings have become the popular choice for homeowners and businesses due to its many advantages. If you want the beautiful appearance of wood minus the problems, go for them with confidence. 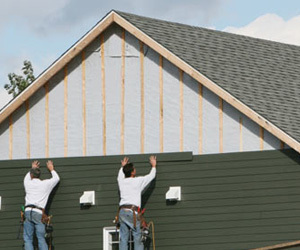 Our vinyl siding installation Ottawa promises low cost and high quality within project completion time. There is no peeling, rotting or discoloration for many years. Also, you don’t have to paint or scrap it repeatedly. It comes in myriad styles, shapes and designs. Horizontal, vertical, brick, wood and stone etc are some common styles available in the market. Simply match the right vinyl siding with the home exterior to create a cohesive effect on the exteriors. When you purchase vinyl sidings Ottawa, consider thickness and style to ensure more curb appeal for your home. New insulated vinyl sidings are fast catching the fancy of contractors in Ottawa. With an insulated backer board, these sidings are perfect way to save energy and create a durable home exterior. With low thermal exterior, these sidings are available in a wide variety of styles and designs. If you want long term durability, energy efficiency and low-maintenance, simply choose insulated vinyls sidings in Ottawa. Vinyl sidings are generally applied on a frame but they are compatible to be installed over wood, brick or stone even. Contact us to know more about the energy efficient and environment friendly vinyl sidings that are a notch above the rest. Our team of vinyl sidings installation in Ottawa makes sure that the project is completed within budget and time.